Saikat Chaudhuri from Wharton's Mack Institute discusses the promise and potential pitfalls of implementing the blockchain. Bitcoin may be getting the headlines, but what makes companies more excited is the blockchain, the decentralized ledger technology that underpins cryptocurrencies. It has the potential to revolutionize everything from financial settlements on Wall Street to global supply chains. But like any promising innovation, there’s also plenty of hype that comes along with it. Saikat Chaudhuri, executive director of the Mack Institute for Innovation Management at Wharton, wades through the hyperbole to discover the true promise of the blockchain and presents strategies on how companies must approach this technology to be successful. He offers a roadmap for companies to follow as they consider adopting the blockchain. Knowledge@Wharton: The blockchain is garnering tremendous interest in business circles. Can you tell me why people are so excited about it? Saikat Chaudhuri: There’s a lot of, I dare say, hype around it. But the excitement comes from the fact that the blockchain technology promises to really revolutionize how we conduct any kind of transaction, be they financial or otherwise, to make it much more efficient and perhaps much more effective. And that applies to the banking system, tracking of goods and services, interactions between suppliers and vendors — any kind of transaction you can think of. Knowledge@Wharton: What is the relationship between blockchain and the bitcoin? One of the most common beliefs is they’re the same thing. Are they? Chaudhuri: They’re absolutely not. There is a relationship between them though, which is that bitcoin uses the blockchain technology. The blockchain technology facilitates these transactions. It’s basically a ledger. Bitcoin was one of the first applications of blockchain technology; it’s a digital cryptocurrency. So, people synonymize both of them, even though actually they’re not the same thing. Bitcoin just happens to be something that uses blockchain. Unfortunately, bitcoin doesn’t always have positive connotations beyond the movements in the market, which have been negative as of late. Bitcoin has been adopted oftentimes by, for instance, the underworld in order to conduct transactions because it’s a currency that can be used by people who want to be outside of the tracking of the usual financial transactions. It’s been convenient for them. That’s one application. Knowledge@Wharton: In layman’s terms, can you explain how blockchain works? Chaudhuri: Think of blockchain as a distributed, shared ledger. That’s really all it is. In other words, you can see what transactions are being made, and when, and what they’re all about. That’s basically what blockchain is. It’s just a shared recordkeeping device for transactions. Now it has a few attractive features associated with it. One is that it’s very transparent. All parties who are part of a transaction, they can see the transaction simultaneously. Think of collaborating on Google Docs, for example, even though it’s a bit more sophisticated than that. The other piece of it is that it’s almost uneditable. People can’t manipulate the ledger’s transactions record. Now what does that mean? Think about it — any transaction you do, all the parties that are involved can see it. Let’s say you’re transferring money from point A to point B. 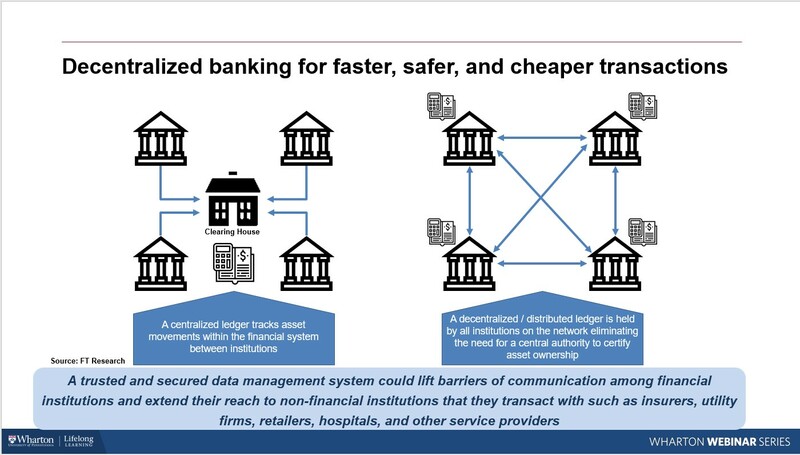 What banks use today is the SWIFT network, which is on the back end. Let’s say you send some money. A whole bunch of different intermediaries confirm that you have the money and it gets transferred from one place to another. And then eventually your money arrives at the place you want. That’s also why even though we have cool apps now that let you deposit checks using your mobile device, it still takes a few days for the actual checks to clear. With blockchain, what happens is essentially the transactions are seen simultaneously by all parties. So, the transaction can be conducted instantaneously or near instantaneously. Everybody can just adjust their accounts. The way it works is that the data is recorded once. You can’t really change that data, but all pieces of data that are associated with a transaction are locked together in a chain, hence the name. What you can see happening and what’s very attractive is you can automate certain transactions as well. We call that a smart contract, essentially. If I’m Microsoft and I have licenses, let’s say, for my software that are given to different companies, you don’t need someone to verify what are the different applications you have the rights to or how many machines have access to that. That can all be done via machine. It can essentially verify all those things and you can automatically conduct those transactions. And of course, everything has a time stamp associated with it too. Knowledge@Wharton: That sounds very disruptive. Can you give us some examples of actual business cases where companies have used blockchain? Chaudhuri: You’ll see them in a variety of different areas. For instance, a cool one that I recently saw is that in India in Calcutta in the State of West Bengal, the first birth certificate was recently recorded in December (2018) using blockchain technology, where recordkeeping is now much more transparent. People can’t manipulate those records in any way. And all the information will be there for everyone to see. Another cool example is in the world of Spotify and music. Music distribution now works in such a way where it’s easy for us as consumers to download different kinds of music. But the way that the artist gets compensated is actually fairly cumbersome. So, at the end of, let’s say, a quarter or any kind of time period, somebody tracks how many times a song has been downloaded and then a check goes out to pay the artists. Now if you use a blockchain technology where you can see the transactions coupled with a smart contract, immediately, or near immediately, when a song is downloaded the actual artist can receive their payment. Some of the music or media companies that are offering songs to download are using this technology. Knowledge@Wharton: You say in the paper that blockchain may not be for every company. Why not? Chaudhuri: Blockchain is an attractive technology in general, which can help speed up transactions and make them efficient. But there are a number of challenges associated with it that we haven’t quite found answers to. For instance, the financial impact is a little bit unclear. You have to invest in infrastructure, right? And gauging the impact is very hard. Another aspect is that certain parties could get disintermediated. Look at the role of banks, for instance. Banks are players who essentially have roles as intermediaries in a transaction. They could get disrupted. So, they’ll definitely resist. Think about the role of lawyers for providing, say, notary services. Those notary services may no longer be required if you can automatically conduct transactions between different parties. There’s also a technological aspect because the technology needs to be refined. We actually don’t have any standards right now for blockchain, even though we’ve got Ethereum and others trying to promote their standard. Then you’ve got the issue of legacy infrastructure and taking on the task of trying to upgrade all kinds of infrastructure at companies to handle these kinds of transactions. That would require a huge amount of investment, even after deciding to use the technology. And then there are organizational and regulatory issues. On the organizational side, you’ve got teams that have to really be brought on board, so your business models might change. And then where do you get the talent from? It’s a new technology. On the regulatory side, beyond the financial, technical and organizational aspects, there are a lot of hesitations. And the reason is that you can imagine after the financial crisis that took place about a decade ago now, in general regulators are very hesitant to move to new technologies to accelerate transactions, especially in the banking world. I understand their hesitation on that front. At the same time there’s an interesting thought experiment, which is that perhaps you could argue that the financial crisis was actually partly caused by power being concentrated too much in a handful of intermediaries. And maybe if we democratize the whole system a little bit then it could be a little bit more open. But certainly, that’s a question that has to be resolved. Where I can imagine technologies like blockchain being adopted more quickly is in some emerging market, such as China or India or Africa, as we’re actually seeing. The reason is even though they may also perceive some of the risks that [Harker] articulated, they also have a financial inclusion problem. In other words, if you were to roll out the traditional banking infrastructure it’d be very expensive. So, they can leapfrog to a technology that facilitates transactions, whether it’s banking, or real estate and property transactions, all kinds of things, in a much more expeditious fashion. There’s a different reward potential there as well. If you look, for instance, in China in some areas, they have so-called sandboxes where they relax the rules and people can use technologies like blockchain to do transactions, even things like giving loans to each other through apps that will allow direct peer-to-peer types of payments at very high levels, utilizing technologies like blockchain in order to track the transactions. 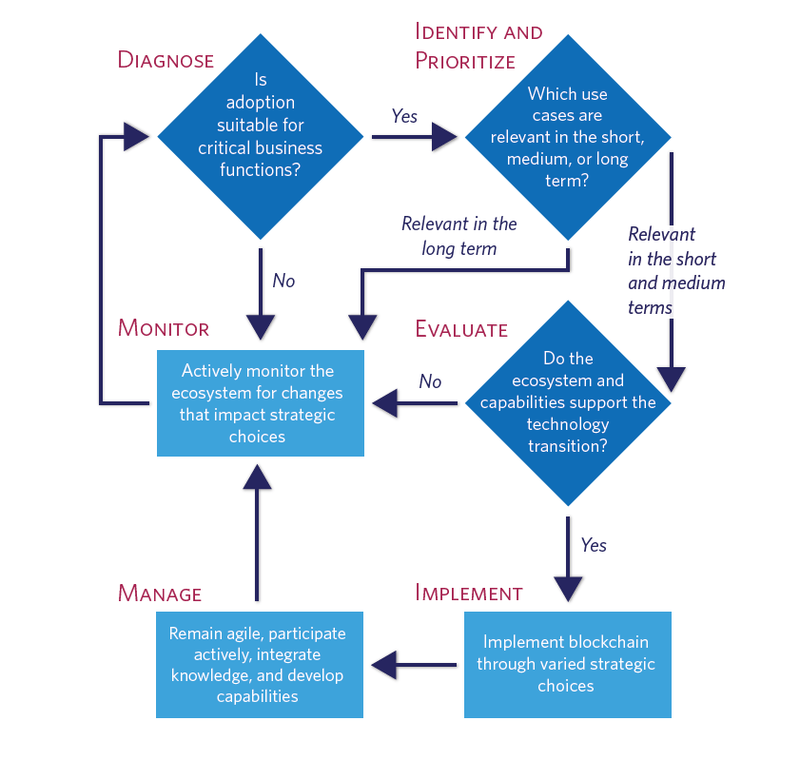 Knowledge@Wharton: One of the things that I really like in the paper is that it presents a road map for firms that might be thinking about adopting the blockchain. Can you go through that for us a little bit? Chaudhuri: Absolutely. We sought to be provocative in this white paper. The ideas here are really intended to provoke a little bit of discussion. We hear a lot about the technical sides and the hype around this and we wanted to put a bit of structure in it. One of the questions to ask is, ‘Do you need blockchain as a solution now?’ Of course, at some point in time if there’s a better technology, blockchain or otherwise, to enable transactions to be more efficient and effective, everybody will go to it. But at this juncture with all the challenges and the uncertainties that I outlined earlier, the question is one of timing. Do I need it now or not? In certain places where you have supply chain functions, where a lot of vendors interact with each other, that’s a case where you’ve got a lot of infrastructure, a lot of parties, a lot of contracts that need to be enforced. Think about that as the infrastructure being ready, as well as having a high base of transactions that need to occur. If you look at an Amazon for instance, or any major industrial company, anybody who’s out there who needs work with their supply chain and huge ecosystems, it’s a very natural use case to say make it more efficient. The reason it’s also a little bit safer is because the parties actually know each other. Those concerns that the Philadelphia Fed president had articulated to me are not as prominent because parties know each other. On the other hand, if you look at small vendors, mom and pop stores and other places, they may have a lot of different customers, but they also may have a small number of transactions and they certainly don’t have the infrastructure. So, it’s not going to be as useful. Once I’ve established that, then I can move into finding out where to use it. With most technologies nowadays we have this temptation to get very excited about all kinds of applications. But the key is what are my use cases? Is my procurement function where I want to have it? Or if I’m Johnson and Johnson, is one of my challenges not being able to accurately track the genuineness of a drug? Let me keep tabs on it using a blockchain technology. Or if I’m Maersk, which is one of the world’s largest shipping companies, do I use it to track containers, for instance, and customers and where things are happening in terms of each point, and what’s happening at each stage where I can see not only the activity but specific use cases as well? Once I decide that, then I have to think about the ecosystem. Are my suppliers in a position to do this? Do they want to do it? Do they trust me? And do they have the infrastructure? I have to help them. And then I have to get to a point and ask the question, ‘What would it take to actually implement it?’ There are a lot of questions here. How do I source the new technology and the capability for doing it? It’s so new. I can choose a number of different methods to go about it. I can do so internally. For instance I can say, ‘Let me build up a team that does blockchain.’ That certainly makes sense in order to have control over it if you see it widely applied very, very quickly. I can also say, ‘Let me partner with another company that understands it really well.’ There are a lot of new startups and tech companies out there which really do this kind of work. That takes some of the risk off of me and I can try it on a smaller scale. Then finally, I can buy one of these blockchain firms to acquire the in-house technology to do it and get the teams with expertise about the technology. But that also brings a lot of risk, especially at this early stage because you’re actually paying for it and you have to integrate — even if you’re not sure where the technology is going, so it might be a little bit of an early bet there. Once you’ve done all that analysis you can implement it and roll it out. I still recommend doing it in a phased fashion where you try a few use cases first. Play with it a little bit, and then expand it if it works out for you. Knowledge@Wharton: Given the list of potential pitfalls ahead for companies looking to implement the blockchain, what do you think are some of the wrong ways that they are thinking about or implementing this technology? Chaudhuri: Whenever you have something where there’s a lot of excitement and maybe not as much understanding associated with it, the tendency is the ‘fear of missing out’ phenomenon. We see a lot of companies … just talking about blockchain. One of the biggest problems is people get enamored with a technology and don’t think so much about this question of, ‘Do I really need it at this moment, and if so, how will I implement it? Am I even ready for it and how much money will it cost? And what impact will it have on my partners as well?’ These are some of the challenges that we’ve seen. The other part is purely technical. I’ll give you another example. If you think about all of these transactions taking place, somewhere you have to conduct these transactions. From an energy efficiency point of view, there are arguments to be made that it’s really inefficient at this moment. So, that’s another facet. The other part is that people are either not willing to try it or they rush into it. They’re jumping in very aggressively or just waiting and seeing. None of those is really the right answer if you’re a company that has a lot of transactions where you could easily do it, such as with your suppliers, and the infrastructure is ready. Instead of this trial and error, do a few things that’s there. And the final pitfall or maybe misconception that I see is they think that blockchain as it is, is the be all and end all. That’s propagated by certain parties and that’s understandable. There are so many questions to be answered that I think it’s really important to bring those up. Right now, what you have is a lot of companies that are promoting like the Ethereum standard, but it’s really on the developer and the technical side. What we really need are coalitions of adopters of the technology who will then advocate for a standard that works. That’s what we kind of saw in other areas like telecom too, and that will help them. Chaudhuri: This is very much the beginning. We have a number of things in mind. One is that we want to really get people’s reactions to this. And as I mentioned, this was a very general primer at the moment. It’s meant to tickle the interest of not just the CIO of a company, but the CEO and other general managers and give them a basic platform to have a conversation on. What we plan to do as part of a larger fintech initiative is follow how transactions are changing. We’re going to focus a little bit on the banking industry first and see how that can potentially change, seeing that there are leapfrogging examples in different emerging markets. We might even have a conference on it. But certainly, we’re working on some papers in that area as well and then we’ll broaden it again to see the adoption. We also have a few events lined up.